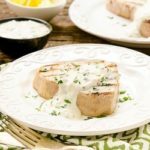 Keep your kitchen cool and fire up the grill to make Grilled Tuna with Mediterranean Yogurt Sauce. The creamy sauce is packed with healthy ingredients. Place tuna steaks on a plate or platter. Whisk together olive oil, lemon zest, lemon juice, and Greek seasoning. Pour mixture over tuna and turn to coat both sides. Grill tuna until desired doneness (about 2 minutes on each side for medium-rare). Serve with Mediterranean yogurt sauce. For maximum flavor, make sauce a day in advance and chill until serving.